Since 2006 our campaign has had a friendship link with Choche Coffee Farmers’ Multipurpose Cooperative, a Fairtrade certified producer organisation in Ethiopia. Choche is the legendary birthplace of coffee and lies in the western part of Oromia Region, in the old kingdom of Kaffa (from which coffee possibly takes its name: Kaffa » caffe » café » coffee). It is one hour’s drive north of Jimma, a bustling university city of over 200,000. Jimma is about 300km southwest of Addis Ababa, Ethiopia’s fast- growing capital. In the early years our friendship grew slowly, but now it is a very significant aspect of our activities and also of our lives. To begin with, our visits were made possible through the Oromia Coffee Farmers’ Cooperative Union, whose recently retired General Manager, Tadesse Meskela, is known to millions around the world through the film, Black Gold. 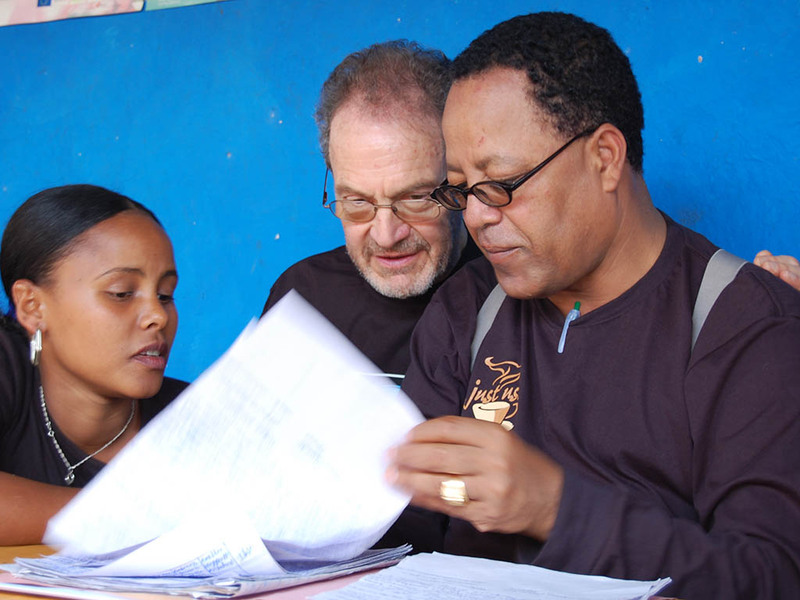 Our friendship with Tadesse started when he presented us with our Fairtrade Town award in March 2005. Underpinning our friendship with the coffee farmers of Choche is the common cause of Fairtrade – they as producers of fine arabica coffee sold into the Fairtrade market; we as campaigners promoting Fairtrade. Their cooperative was first certified Fairtrade in 2004. At that time cooperative membership was small with less than 200 members, and they sold only a tiny amount of the community’s total production into the Fairtrade market. This was done through the Oromia Coffee Farmers’ Cooperative Union of which they were, and still are a member. The cooperative had just come out of the very tough years of the coffee crisis (see Coffee and Ethiopia) which had very nearly bankrupted it and left many farmers destitute. 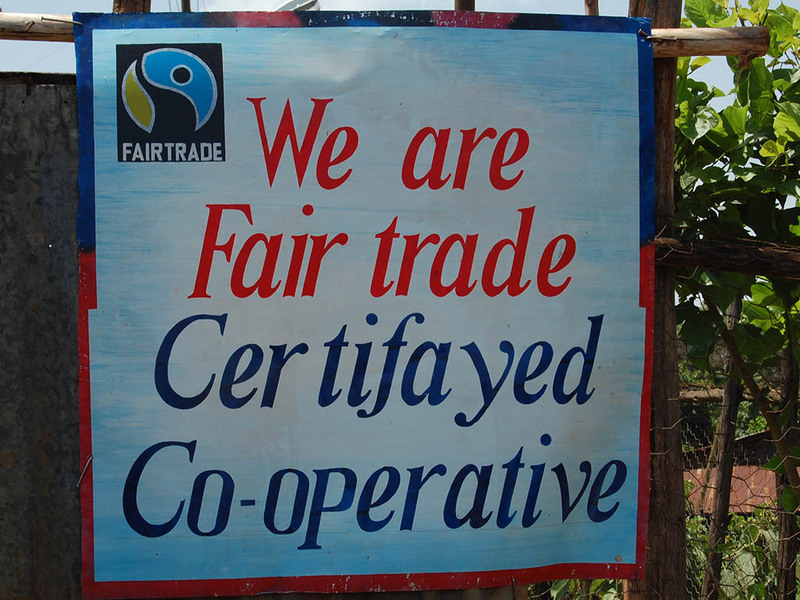 However, since those early days cooperative membership has grown steadily as more and more famers have seen the benefits of joining and have also realised that Fairtrade is valuable to them, through the guaranteed minimum price and the Fairtrade premium. Membership now numbers well over 1000. With more members has come more premium, and with more premium have come ever more ambitious projects. Investments in the early years included the protection of two springs to improve drinking water quality and for the construction of four simple mud and wattle classrooms at the local school. More recently a health post and a bridge have been built for one of the outlying communities (Andode). Most recently a new kindergarten has been built for another community (Bulbuloo), and a computer lab at Choche High School. Whereas premium investments in the early years amounted to a few hundreds of pounds, the kindergarten and computer lab each cost over £40,000. This ‘discovery’ and our mention of it to one of Keswick’s Rotarians in 2009 sparked the germ of an idea for the Rotary Club of Keswick to fund a micro-finance scheme to enable at least some of Choche’s farmers to escape this burden of household debt. Since Rotary International is committed to micro-finance as an important development tool, it was felt that the project proposal could attract international matched funding (as it did). In March 2010 our next visit to Choche included a member of Keswick Rotary who sounded out the farmers about the proposal. They were very enthusiastic, not simply because it would enable them to escape the cycle of persistent private debt, but would also make it possible for indebted farmers to sell their coffee to the Cooperative and so benefit from the Fairtrade price and the community benefit from a larger Fairtrade premium. A second element to the proposal emerged and was subsequently added when some of the women asked if they could also benefit though small loans to set up businesses. After agreement was reached in Choche, Keswick Rotarians then committed themselves to raising £10,000 from local, district and international sources. They also accepted a contribution from Keswick Fair Trade Campaign. Deratu Muduga Savings and Loans Society, into which participants save, as well as borrow from, has now been running since September 2010. It is overseen by the Rotary Club of Jimma Central. Sixty four farmers and 51 women have benefited from it. The repayment rate has been 100%. The businesses undertaken by the women have include the fattening of animals, the establishment of coffee seedling nurseries, the development of honey production and setting up small shops. Following the success of the micro-credit scheme, Keswick Rotary devised a second, more ambitious project. We have long known that even for many of those farmers who sell to the Coop incomes are small, because their farms are tiny and their coffee bushes are old and low-yielding. To earn more, they have always known they needed more productive bushes. There are two ways of achieving this: one is to replace old bushes with new higher yielding varieties; the other is to ‘stump’ (coppice) their old bushes. High yielding bushes can produce up to five times more than the old ones, and stumped bushes up to twice as much. However, to put into action either of these strategies requires land to be taken out of production: in the case of higher yielding bushes for 3 years and for stumped bushes 2 years. Only the larger farmers can afford to do this. Keswick Rotary’s ‘Million Birr Project’ (= £35,000), which commenced in 2013, is aimed at helping to solve this problem. It works by making longer term loans available to selected farmers while a proportion of their land is unproductive up to the time that their new and stumped bushes start to yield. It is also funding training in coffee bush management; supporting a programme to help unemployed young people set up businesses such as coffee nurseries; and is extending more loans to women to help them further diversify their incomes. With more and more benefits accruing from Fairtrade and with Rotary’s significant investments in the two loan schemes, as well as government-sponsored development programmes, Choche now feels a very different place from the one we first visited in 2006. To us this is a very positive story.